South America: Rio Amazonas, northeastern Brazil. 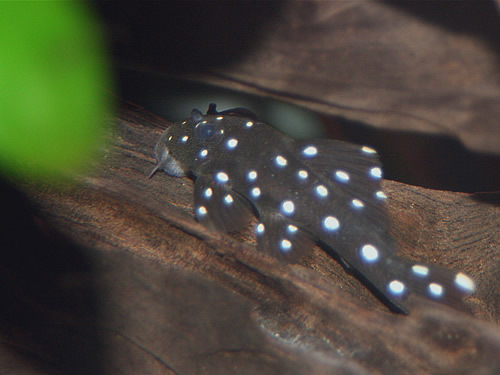 This reasonably large Loricarid prefers a dimly lit tank with a good number of hiding places, either created with plants, drift wood, rocks or artificial (pleco spawning) caves. To keep more than one adult specimen in the same tank, or together with other bottom dwelling fish, you need at least a 48x20" (120x50cm.) tank: this fish can be quite territorial, and when suitable hiding places are lacking, it can be aggressive towards other bottom dwellers. 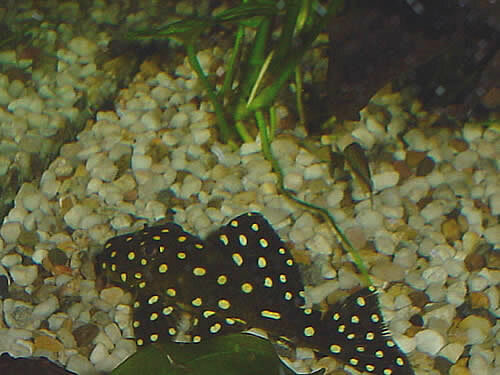 When kept as only catfish in an aquarium, a tank size of 40x18" (100x45cm.) is sufficient. A powerful filter system is recommended, as this fish appears to have an insatiable appetite, and produces a lot of waste. Although this species is hardy and adaptable once acclimatized, like most other Baryancistrus-species it tends to grow extremely slowly, if at all, in captivity. The main reason for this is that in most cases these fish are not kept under the proper, natural conditions. 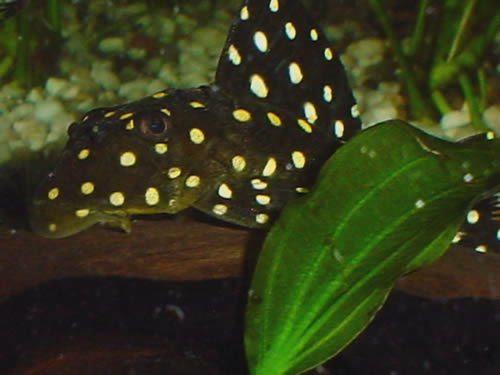 In the wild, the Snowball Pleco is typically found in shallow, because of direct sunlight very warm, fast-flowing bodies of water that are very rich in oxygen. Under these circumstances, the rocks and pebbles between which these fish are found, are more or less permanently overgrown with a layer of organic matter consisting of both animal and plant matter (also known as "Aufwuchs"). The high water temperature results in a very high metabolic rate, because of which Baryancistrus-species spend a substantial part of the day on feeding. It may not come as a surprise that these conditions, that are very hard to reproduce in captivity, are required to keep these fish under natural conditions and to obtain a normal growth rate. In other words, this species is primarily suitable for a specialized species tank. 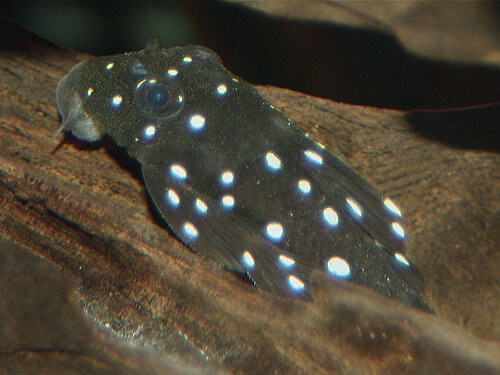 A look at the mouth of the Snowball Pleco reveals that this species is an "Aufwuchs" eater. Aufwuchs is the organic layer, part plant, part animal (small crustaceans, fresh water sponges, larvae, small insects and their eggs, plankton), that forms on submerged surfaces. The fish uses its large diskshaped suckermouth, equipped with lots of tiny teeth, to graze on these surfaces. Once acclimatized, this species of Loricariid will usually readily accept meaty foods (shrimp, krill, mussels, bloodworms, mosquito larvae) as well as vegetable matter (vegetables, pellet food, algae and, to the dismay of many aquarists, also aquarium plants). The emphasis should be on vegetarian foods, however: too much protein-rich, meaty foods can lead to obesity, digestive problems and in the worst cases even death. In my experience, during its acclimatisation phase, this fish is pretty shy and not very suitable to be kept together with more active and boisterous bottom dwellers. 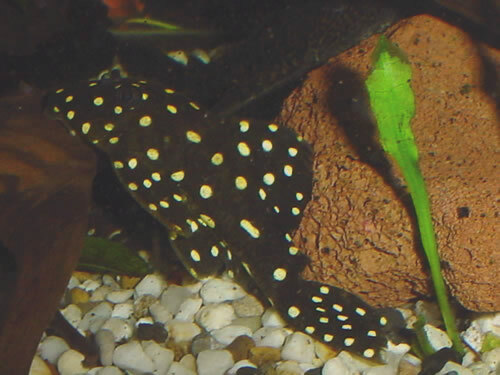 Because of this reason, the Snowball Pleco may starve to death if kept with other catfish, so it's recommended to keep it seperated during its first few weeks (to ensure it is healthy and eats well). Once introduced in a community tank, it is still advised to closely monitor this fish, to make sure it competes well: a sunken belly and eyes that have 'retracted' into their sockets are signs of malnourishment and poor health - fish in this sort of condition are almost impossible to nurse back to health, and should be kept in a small quarantaine tank to maximize the chances of survival. 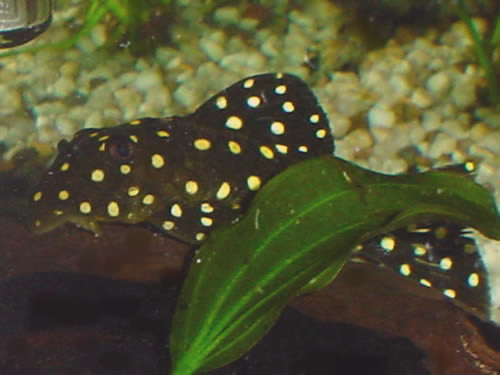 Baryancistrus pleco's are notorious for being very hard to acclimatize, and a substantial percentage of all fish imported die within the first month or so in captivity, due to stress and malnourishment/starvation. Another common and often fatal problem with recently imported Baryancistrus is problems with the bacterial intestinal flora, which has become negatively affected by shipping: the dieing off of vital bacteria in the gut causes digestive problems and problems extracting, especially during the first weeks of captivity essential nutrients from the food the fish eats. Fish being sold need to have been in quarantine at the importer/seller for a at least a few weeks, to maximize the chances of survival once brought home. Fish that haven't been through this procedure can often be recognized by the sunken eyes and belly - most of these fish will die within a few weeks at most. Once at home, the quarantine procedure isn't over yet: before being introduced in a tank with other fish, Baryancistrus should be kept in a small separate tank for at least a few weeks. This is to assure that the fish can acclimatize at ease, can adjust to your specific water parameters. Also can be checked whether the fish eats (reddish to dark-brown feaces, depending on the foods offered, should be noticeable), and what types of food are eaten especially well. Once the fish eats well, is active and alert, and looks/acts healthy (full belly, round, clear eyes and good coloration), it is ready to be moved to a larger tank with tank mates. With the introduction into a larger tank with tank mates, the problems aren't necessarily over, however. 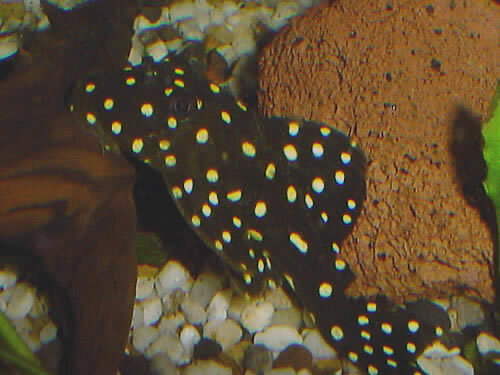 No matter how vulnerable Baryancistrus pleco's are during the first number of weeks, once properly acclimatized it will set up a territory, and will chase off any intruder: not only fish of its own kind, but in many cases also another bottom dwellers will be driven off, often in a very violent manner. In some cases, problematic fish have to be taken out of the tank and moved to a separate tank to avoid stress and injuries, and either put by itself or with very robust tank mates.